Food Safety: The Difference Between "Done" And "Safe To Eat"
Among Americans, one in four say they really don’t know how to cook and by 2015, restaurant sales surpassed grocery sales for the first time ever. So, we love to eat – but why don’t we love to cook? For a beginner in the kitchen, learning to cook both safely and deliciously can be a little overwhelming at first. Maybe we don’t feel confident following recipes, or we aren’t sure what flavors and spices go where. On top of all that, food safety can feel complicated and confusing. And yet, getting started in home cheffing has never been easier; we have technology on our side in that regard. Food scales and thermometers are among the most classic and tried and true tools in any chef’s arsenal, professional or otherwise. A Thanksgiving staple, food thermometers help us determine that food has reached the right temperature, is evenly cooked, and ensuring they are safe to eat. This tool is as old as time but gets a modern update as IoT sweeps over and updates our most beloved too. The Range Dial Grill Pro takes cooking thermometers to a new level by wirelessly connecting to your phone and monitoring food temperature in real time. Alerts can be set when a specific temperature is reached, the type of meat can be specified, and the entirety of the cooking process can be monitored remotely. Apps like Project Foodie and SideChef operate almost like a digital sous chef by offering everything from portion control guidelines, recipes and weekly planners, shopping list organization, and endless recommendations for what to cook next. For the vegan or gluten-free chef, the app simply and aptly named substitutions holds a comprehensive database of ingredient substitutions, alternative preparation options, and may be heavily personalized for any lifestyle. Understanding the basics of food safety is half the battle; knowing when to separate ingredients, washing hands, the difference between “done” and “safe to eat,” and even freezing and refrigeration methods is essential. With high tech kitchen tools like the ones mentioned above and the others in this infographic below may help us more clearly understand the value and importance of safe cooking every step of the way. A pinch of salt here and a dash of pepper there, cooking is easy to learn, yet difficult to master. 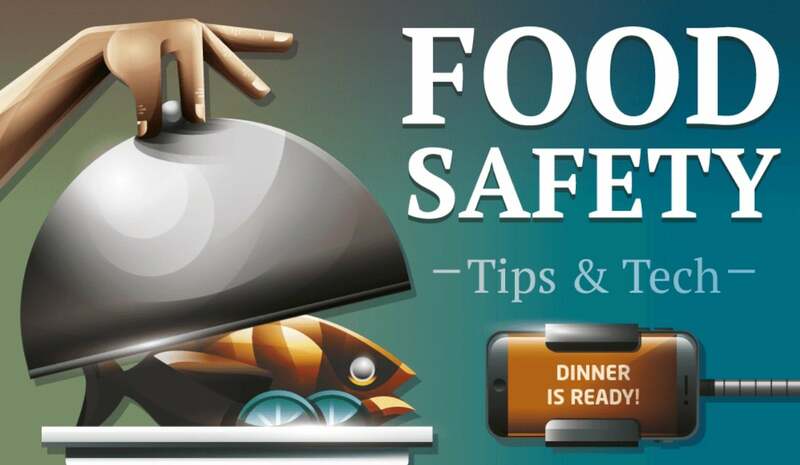 Here’s how to tackle food safety, plus some cool gadgets that make home cooking a breeze, detailed in this infographic.